Anzeige/ Ad: Today’s blogpost isn’t mainly about fashion and my outfits, but concentrates on the new Mercedes-Benz Concept EQ. 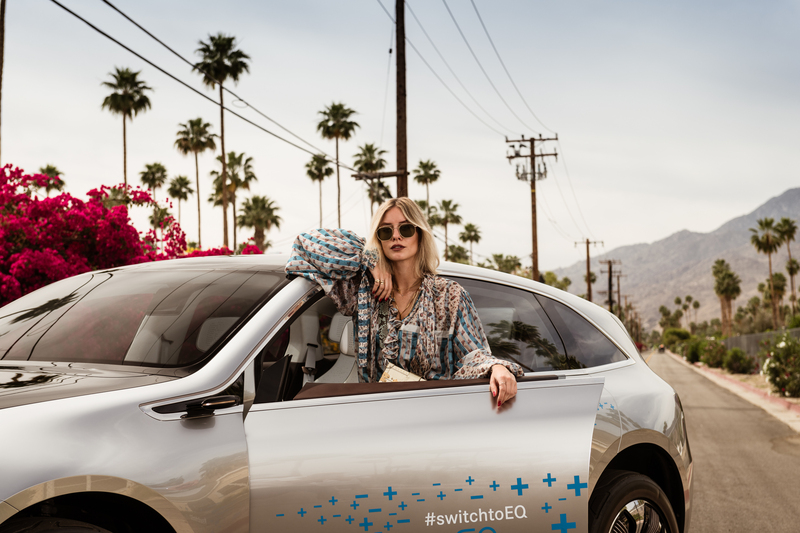 I had the amazing opportunity to experience the Concept EQ during a test-drive in Palm Springs a couple of weeks ago. Finally I am back in Germany to show you the result of the great outcome of my shooting with Mercedes-Benz. Over the past years, Mercedes Benz Fashion Engagement has established itself as a main supporter of the global fashion sector. 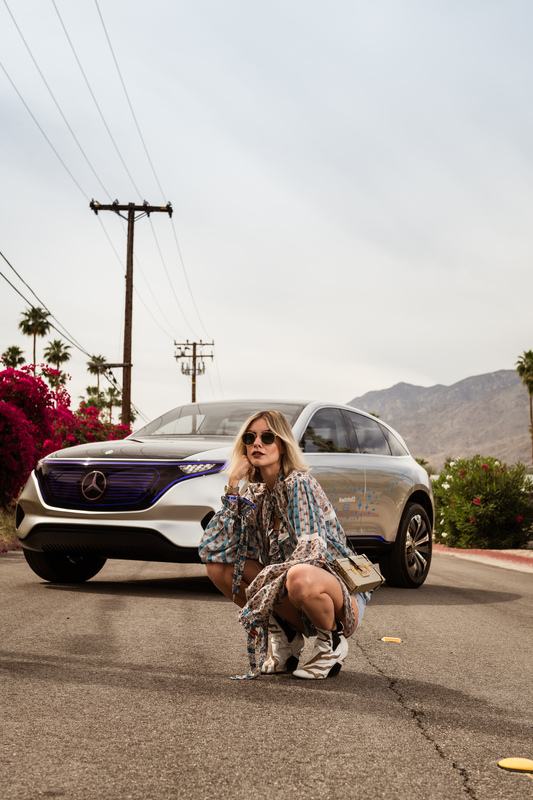 In 2017 the #mbcollective fashion story was launched under the theme ‚Generation Now, Generation Next‘ along with the new electromobility brand Mercedes-Benz EQ. Right now, Mercedes is working on the next stage of the #mbcollective fashion story. Seven visionaries from the creative industry are brought together to explore and discuss the potential of the future and how the fashion industry will react to the future of mobility. Furthermore these global visionaries will gather around a table to develop a vision driven by confidence, inspiration and creativity. The new campaign is titled #WeWonder. It uses a variety of digital channels to communicate with the numerous representatives of the fashion industry. Additionally each visionary will explore a specific topic within the #WeWonder campaign in 2018. In March, writer and curator Kimberly Drew was the first to launch her theme of ‚Equity‘ for the #WeWonder fashion story. Luckily I had the chance to take part at the second presentation of the campaign with model Slick Woods in Palm Springs. Mercedes-Benz gave us the opportunity to take a glimpse at the new Concept EQ and experience the interesting panel talk live. Slick Woods dealt with the topic of youth. She herself represents a completely new generation with her unique style, covered in tattoos and her shaved head. She pointed out in what direction our style is developing. Furthermore she explained how she sees the mobility of the future. According to her we are always craving for designs that represent the future we actually want to see. Most noteworthy Concept EQ represents that future we want to live in. Fashionable, sustainable and always connected. Additionally to the super interesting talk, I was able to experience the new Concept EQ during a test-drive. Obviously I enjoyed the drive to the fullest. The cool live performance of upcoming musician Lion Babe rounded off a perfect day. I really like how Mercedes-Benz always creates a connection to the fashion industry. Just as clothing always defines a certain epoch, Concept EQ will define our digital age. With ConceptEQ Mercedes provides an outlook on a new generation of vehicles. Those electrically powered vehicles are placed on the market under the name EQ. The new brand stands for a comprehensive electric ecosystem of services, technologies and innovations. Anzeige/ Ad: Thank you Mercedes-Benz for a perfect weekend in Palm Springs. Das Design des Wagens gefällt mir sehr gut und die Ausstattung ist ja mal mega cool. Das mit der neuen Art von „Spiegeln“ mit der Projektion auf Displays ist echt der Wahnsinn! Ich finde es total krass, was in der Automobilbranche auf uns zukommen wird. Jetzt kann man sich das alles noch gar nicht so richtig vorstellen, aber vermutlich wird es in spätestens 10, 15 Jahren Realität und „ganz normal“ sein. Ich bin auf jeden Fall sehr gespannt was noch so kommt und bin ein großer Fan von Elektro-Autos!